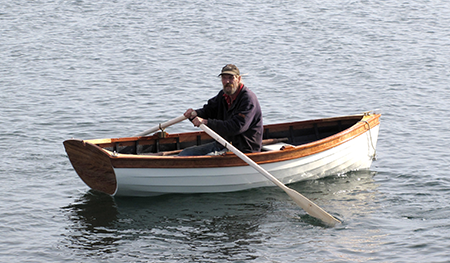 When Hollywood actor Billy Campbell needed a tender for his Dory Shop-built schooner, our master builder suggested a dinghy based on the lines of one he had built for himself years before. The result was the extraordinarily handsome, and ambiguously named, Martha yawl (Is the boat named for the schooner Martha Seabury or for Jay's sweetheart? We're not telling!). This is a boat with beautiful details, from her wine-glass transom and steam-bent frames all neatly riveted in place, to her slotted gunwale and custom finish. And she rows like a dream!